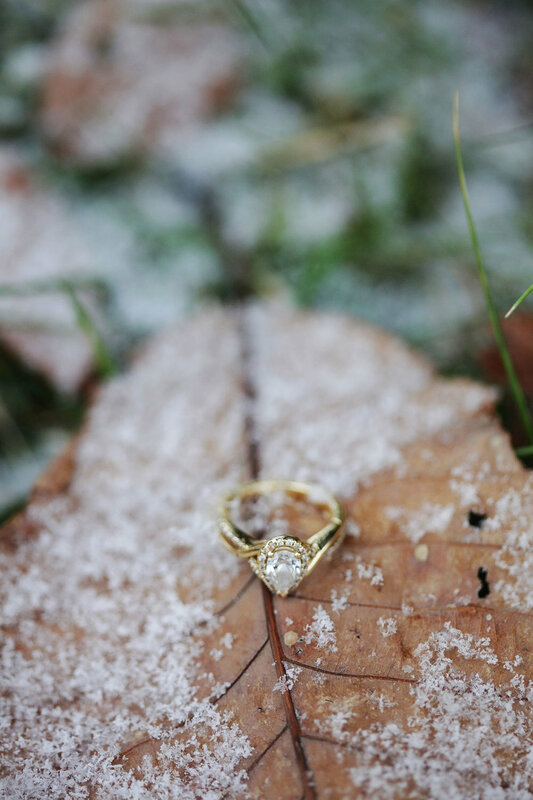 What to Wear to Your Winter Wedding Engagement Session — Catalyst Wedding Co. Here we are in 2019! Smack dead in the middle of winter, too. Congrats to all the couples who got engaged at the end of 2018! If you're considering booking your engagement session during the chilliest months of the year, have no fear — the cold season is a perfect opportunity (and excuse) to be close and cuddly with your significant other. You can stay warm and look amazing without your entire session being photographed solely in your coat. With the added cold, choosing your outfits for your engagement photo session can be difficult. Here are suggestions to help you stay warm and stand out. When we think winter, we think Navy blues, Pine greens, Cranberry deep reds, Sugar Plum purples and of course the classic Snow White. There are typically three ways to match your color palette for your outfit: complimentary, analogous and triadic. Complimentary colors are your primary and secondary colors that work well together. Analogous colors are three shades of the same color (similar to a gradient). Triadic colors are the colors spaced out in between that form a triangle on the color wheel. Triadic colors often create a bold look — think fuschia and turquoise. If you're a minimalist, wearing a neutral color like grey and adding a pop of color here and there works out well, too! Winter gives you an opportunity to attempt multiple looks! You can layer it up with a long sleeve top, scarf, boots, and a neat coat that you can put on and take off as needed (also, a large cozy blanket is a wonderful alternative). Search Etsy to add a special touch to your session with a personalized monogrammed blanket or scarf with you and your significant other's initials. Not only is it functional to keep you warm, it also makes a great keepsake! You could always keep it simple with a plaid flannel and jeans. Really think about complimenting each other's outfits here. Get a little cozy and pull on your favorite sweater or a cable knit cardigan! It goes great with any classic bottom, whether pants or a skirt. Want to dress it up a little? Pull out the stops with a long dress and faux fur wrap or dress pants with a button down and tie. You'll be channeling Hollywood vibes with this winter look. If you’re looking for glittery, I highly suggest the Aretha Gown by Lazaro as an inspiration. Not only is it long and shimmery, the warm champagne color can add a subtle pop against any wintery wonderland background. 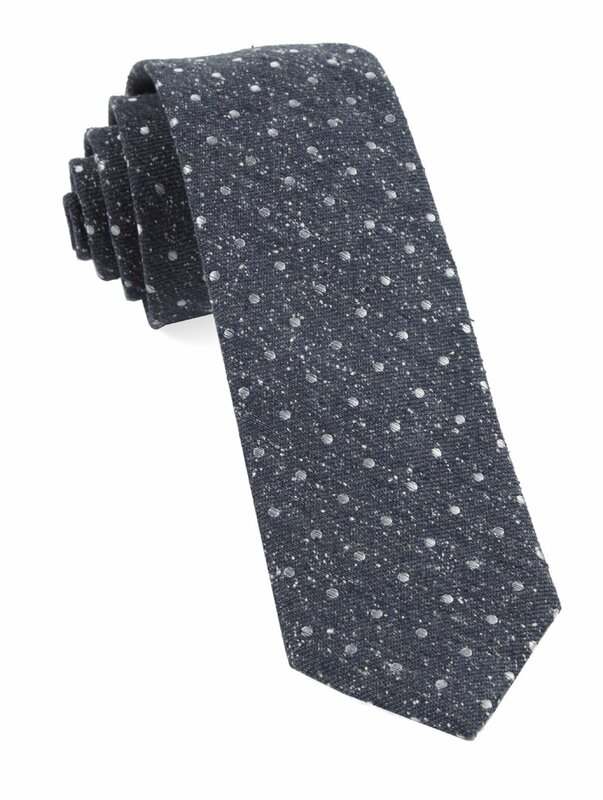 The Tie Bar has some amazing winter selections like the Knotted Dots tie, which has a polka dotted pattern on textured silk that appear silver in some lighting. 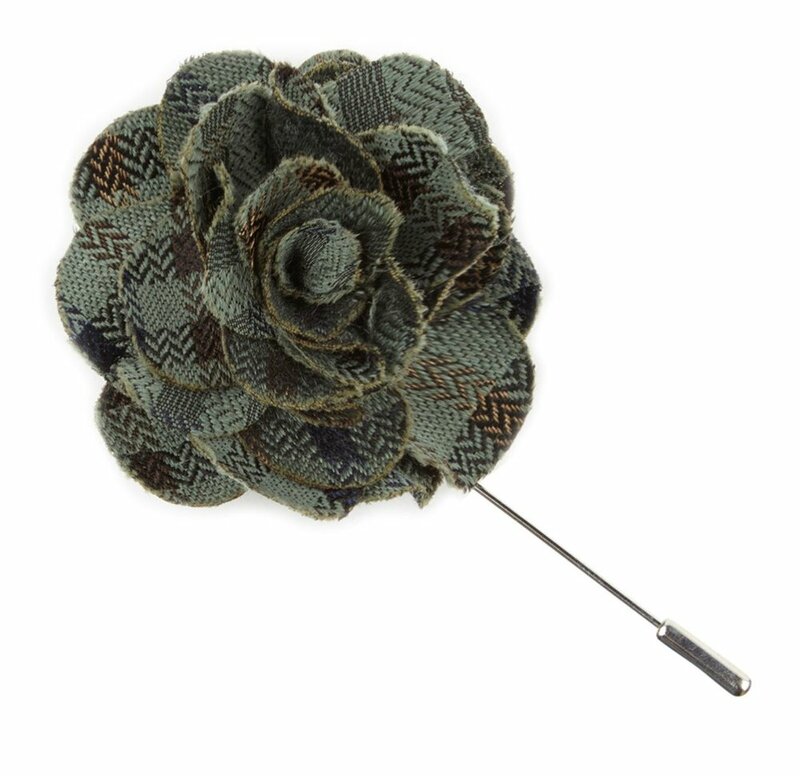 The beautifully crafted wool or silk flower lapels are a nice warm touch to any suit! There you have it! As long as you remember to stay away from busy prints, bulky jackets, out of season colors and anything you feel unflattering in, you can dress it up or dress it down as much as you like. If you have a theme for your wedding, try to incorporate that into your outfits, especially if you’re using these images for save the dates. It will tie it all together nicely. Stay warm and remember to have fun! La'Quitia Denson is the wedding and portrait photographer behind Beyond The Pond Photography. She serves the Northeast region of Pennsylvania including the Greater Scranton/Wilkes Barre area, however she's always willing to travel. While she loves cuddling with her cat, Anubis, reading thriller novels, trying new cuisine and letting loose to all kinds of music, you can find her advocating for the LGBTQ+ community as a bi woman, elevating Women of Color and fighting for all around justice of marginalized folks of all kinds.